eBay and Amazon have different audiences, so you need both. And since you need a website to brand-build, rank in search, and reach non-marketplace customers, you probably also need something like Shopify or BigCommerce. List each product that you sell in three different places. Sell 50 products? Create 150 listings. Sell 500 products? Now it's 1,500 listings. Process orders in several places. You'll log into three different websites and use three different systems each day just to keep orders shipping. Survive inventory madness. If you have nine of something to sell, do you list three on each platform and hope for the best? Or do you list nine in each place and hope you don't receive 27 orders? Update everything in three different places. Product updates. Restocking. New listings. Pricing. Policies. Will you really make every single change in three places? Are there three of you? On top of it all, there are these other services, like inkFrog, that seem to do something... important. But what? And how does this something relate to the many-platforms problem? Let's get back to that problem. You've opened an eBay store, an Amazon store, and a Shopify store, and you feel so overwhelmed that a booth at the craft fair is starting to make more sense. Here's how inkFrog relates to this problem: inkFrog solves it. inkFrog enables you to sell through one or several storefronts without multiplying your work. "So very happy when I found this app. It makes our business easier and saves our time. Highly recommended for all drop-shippers who are selling on both eBay and Shopify." It's true that thousands of eBay-only sellers use inkFrog to manage their listings. inkFrog's software is more convenient and powerful than eBay's own tools for creating professional listings and templates, managing inventory levels, and fulfilling orders. Use inkFrog to manage and fulfill orders for all of your sales channels. By using inkFrog, you make eBay, Amazon, and Shopify your storefronts, not your life. Your actual business and all of your master lists live in inkFrog. "Great app! Started with the free version to try it out and found it very easy to use. As soon as the orders started coming in I upgraded to the paid version. Have had a couple of small issues but all was sorted straight away by the very helpful support team, thanks!" Since this is what inkFrog is for, inkFrog makes it easy to manage all of this in one place, interacting with eBay, Amazon, Shopify, and other platforms for you, to keep everything simple, tidy, and humming along. "Does the work. It is easy to manage our eBay stock. I like that when I change a product in Shopify, it updates eBay. With over 500 toys and games, we sure need a good app to manage it." You create an inkFrog account. You link your eBay store to inkFrog as a part of the signup process. Inside inkFrog, under "Store Connector," you click "Add a Store." You do this once for each online store you have—Shopify, BigCommerce, Amazon, Highwire, and soon Volusion or Magento as well. You configure these inside inkFrog, making rules about how each figures into your business—rules for restocking, for products, listings, and prices, and for creating listings for new products. Each time you add a store, your products there are imported—added to your master inkFrog lists—so that in the future you can manage that product, its listings, and its orders from within inkFrog. 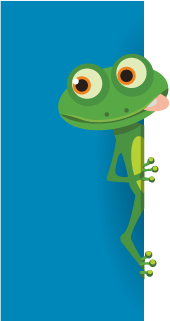 The "Profiles" area of your inkFrog account becomes the core of your business—your product line and policies. All your active listings for customers, on each store, are managed in the "Listings" area. This feeds the public-facing part of your business—what customers see and purchase on your storefronts. All your listing templates and product images live in the "Templates" and "Images" areas. All of your eBay customer messaging is handled in the "Messages" area of your inkFrog account. Manage assets like images—for all of your stores—in one place. That's what inkFrog is for. Yes, inkFrog is a great eBay listing tool that offers hundreds of professionally designed eBay listing templates. But it's also the solution to a bigger problem. You get to manage your business and multiple storefronts from one place. You see and process orders, respond to customers, create listings, and manage inventory simply and automatically—for each of your stores—without logging in elsewhere. inkFrog makes e-commerce make sense. Make sense? So give it a whirl already—click here and try it!